Tammie Alvarado of Tulare, Calif., puts her twist on this black lace French. Tammie Alvarado (@tntalvarado316) of Tulare, Calif., puts her twist on this black lace French. 1. Buff the nail with a fine-grit buffer. 2. 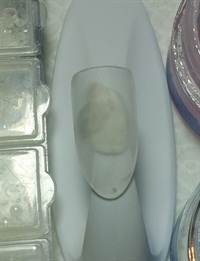 Dehydrate the nail then prime it using pink builder gel and create a gel overlay. 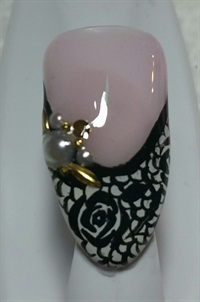 Once cured, use the white gel-polish create a French mani. 3. 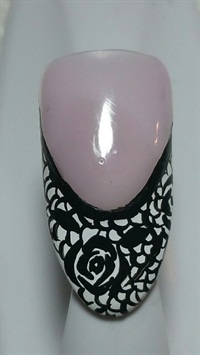 Cure and wipe the tacky layer then add a lace print using a stripper brush and black acrylic paint. 4. Apply clear builder gel over the entire nail. Before curing, add half pearls and embellishments. Cure then wipe.